Discussion in 'Character Biographies' started by Anonymous, Apr 13, 2019 at 9:59 PM. 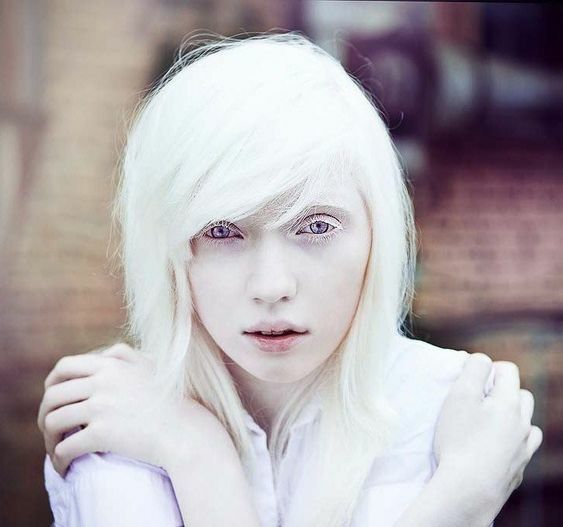 Appearance: Ivy is an albino with snow white hair and extremely pale eyes. Bruising and other injuries show up quite easily on her pale complexion and this can clearly been seen on her right knee. Place of Origin: Ivy was raised in Troy Michigan and went back and forth between her mother's place in Troy and her father's place in Ypsilanti. Personality: Just like how white light resembles purity Ivy aspires to be kind to everyone even if she doesn't really know them. She is not one for violence and usually tries to find diplomatic solutions. Also when it comes to injuries Ivy is the last person that should be asked to help, blood and gore are not her kind of thing. -Ivy is a very skilled writer and usually has a few notebooks on her. Her dream was to become a very successful author one day. However, just because she is good at writing stories she does not like it when people try to snoop on her writing pieces when they aren't finished. -Ivy does not walk properly due to an injury she sustained to her right knee while traveling from Michigan to Kentucky. It is uncertain that she will ever walk properly again however, without an actual doctor and anesthetics there is no way in hell she is going to let anyone try and fix it. Even though she can still walk running is a challenge and after awhile can become rather painful.. But she'll be fine. -Don't expect Ivy to drive. -Ivy gets easily flustered about the idea of someone picking her up. Not because it is romantic or anything but because she is short.. And crippled. Relying on someone just hurts her tiny pride. "I feel like I can truly rely on you, I don't fully understand why you want to keep me around though." "I feel like her mind is getting lost in the chaos. I hope its not to late to save her." "I feel like he is quite kind to go after Devlin so many times. I know I wouldn't be able to catch her." "Don't make me regret considering you a friend. And next time put a lady down when she says to!" "You did your best to fix my leg and I appreciate it." "I don't know you that much but you seem so nice and helpful." "Other people out their could need our help, learn to show compassion you inconsiderate prick!" Abra and MindGate like this. Updated.. Its 5:24AM and I can't sleep.. I got over hyped for this launch.